In an obvious attempt to impress me, These two lads got together and put into motion a borderline ingenious plan to become the coolest punks in all of Snowville….drinkin beers while leaning on some poor bastards sculpture. 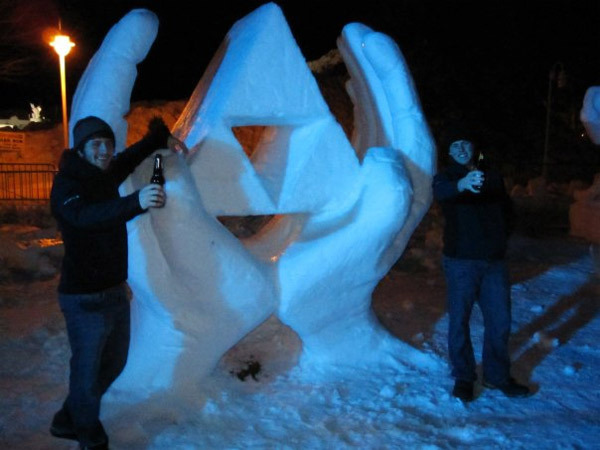 All jokes aside (besides the ones I use), the icy Zelda tribute is pretty impressive. The beer was probably just to help them stay warm as they didn’t have any girlfriends(I had them…I had them…) to tell them to stay the hell inside…or an ocarina to change it to day time. Much more productive than the last time KinderGardenCop and myself were drunk in the snow…closest we got to Zelda was stumbling after female passer-byes with our “Master Swords” out. 02 Dec	This entry was written by CatastroFUCK and published on December 2, 2011 at 9:00 AM. It’s filed under artsy, Awesome, Games and tagged beer is good and stuff, I'll carve your face next, indecent exposure, master sword, snow, swordfight!, thats not cocaine, white stuff, Zelda. Bookmark the permalink. Follow any comments here with the RSS feed for this post.